The right-top corner on the screenshot above shows the editor palette. These are the basic building blocks of a scheme. Further in the text we refer to various tools of the palette by their icons. At the heart of a schema is the notion of a graph. The schema editor is, essentially, a form of a graph drawing tool with the railway stylistic applied. In most cases, a single line connecting two vertices denotes two directed edges of a graph, each going in opposing direction. 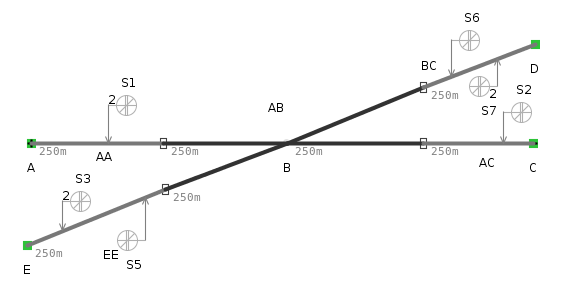 This is interpreted as a bi-directional track (i.e., a track that may be used by trains going in either direction). Points and diamond crossings may require that some edges are removed thus making impossible certain travelling paths. The following is a simple schema showing a piece of track, called segment, connecting some two nodes. Note the mention of a left node in the instructions. To be able to unambiguously assign directions to graph edges, the tool, by default, operates in the mode when all segments are drawn from left to right. The drawing style gives a segment an orientation from which graph edge directions may be determined. It is possible to override this behaviour and manually define the orientation of a segment. Nodes do not necessarily correspond to anything in physical reality. One may use nodes to show the extent of logical track partitioning, e.g., the limits of a train detection circuit or a route, but also as a notational convenience to split long pieces of track and even partition complex junctions into several modelling sub-projects. Node placement and segment connection may be used repeatedly to construct schemas of arbitrary complexity. One small step is to extent the linear track we have by adding new segment and node. release the mouse at the desired new node position and select ‘Create Segment to new Element: Node’. It is often convenient to label nodes and segments of schema graph. Some tools may insist that certain or all nodes and segments are labelled (the well-formedness requirements and naming scopes may vary). A railway is not always a linear track. It is possible to have two segments originating from the same node. In general, SafeCap DSL permits nodes of degree 1 to 4. Nodes A and C above have Degree 1 and called boundary nodes. Node B has degree 2 is called a normal node. A node with degree 3 is always a point while a node with degree 4 is always a diamond crossing. Complex points and crossings may be modelled by placing several points and crossing within the boundaries of a single train detection circuit. The following example illustrates the point node. In the the diagram above, some edges (segments) appear in a different style. What happens here is that the tool has automatically detected that the schema defines a point. Moreover, from the visual layout of segments it has determined which segment is the reverse branch and which is the normal branch. The reverse branch is shown as a dotted line. Node B is now known as a point; segments around this node are highlighted in a darker colour to indicate that they are a part of the same logical entity (i.e., a point). The definition of a point automtically informs the tool that some paths on the graph must be removed. Thus, there is no path connecting nodes D and C in either direction. Sometimes it is necessary to define point topology manually, without having it reconstructed from the visual layout of schema. For this, one must disable the recomputation of points using toggle button located at the top toolbar. As a next step, we shall refine the schema topology by placing additional nodes on the existing segments. This shall make the point area smaller and delineate it from the normal track. After saving (use control key + s), the diagram will refresh itself to show the one above. The topology of a point may be changed to, for instance, swap normal and reverse branches. before saving, make sure to disable the auto point recomputation option . Next we shall get acquinted with another major element of a schema: a diamond crossing. Unlike point, a diamond crossing is stateless – it does not need to be switched between configurations – and it has degree 4, meaning there are two incoming and outgoing tracks. As with points, the tool analysis the relative position of segments to detect which outgoing segments is the most probable continuation of an incoming segment. This behaviour is controller by option and may be overriden with manual setting in the Properties View dialog. if the is disabled, the crossing configuration must be defined manually. For this, select each segment of the diamond crossing and assign its crossing role: there are two independent paths going through a crossing called Direction A and Direction B; exactly two segments of a crossing must be associated with each direction. Once the diagram is saved, the tool will highlight the paths through a crossing. Finally, we quickly discuss how to annotate a schema. 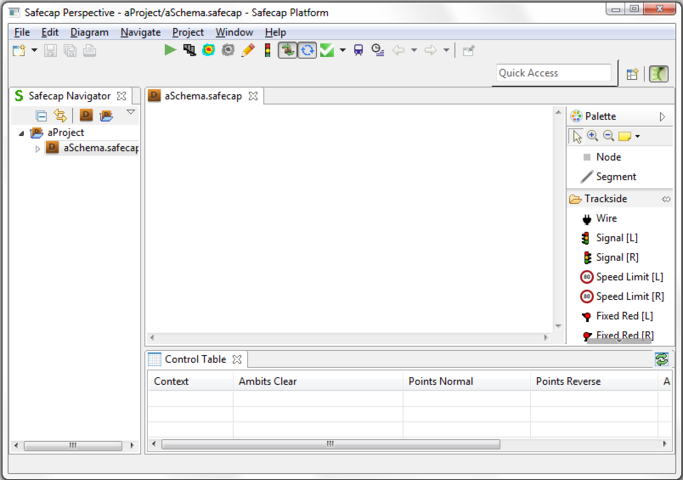 In SafeCap, schema annotations are known as track-side equipment although ‘equipment’ here is merely a metaphor: annotations are logical elements that may be given differing interpretations in different contexts. One import case of annotation is the one use to define routes through a junction. This is done by placing signal signs on the diagram and instructing the tool to compute routes between boundary nodes and signals and between a pair of signals. Note however that signals themselve only serve as a notational element that helps to derive route definitions.